It is the state in Brazil where there is the greatest concentration of iron ore. A state that is rich in natural resources and explored in all its aspects, especially the political aspect, due to the concentration of the wealth. Inserted in the reality of the workers of this state since 1963, having passed through various cities, the Little Sisters of the Assumption make their mission among the poor and the workers a path of evangelization and organization among the people in the steps of Antoinette Fage and Etienne Pernet, seeking to “refashion a people for God”, in a simple and committed way. She is localized in the city of Ibirité, in the metropolitan region of Belo Horizonte. The community has three sisters: Agda da Penha de Sousa, Villma Huanca Tipa and Mariotides Gomes Bezerra. The reality of the city of Ibirité, like the whole world, is constantly changing. We note that in a few years there has been a great increase in violence, mainly domestic, which has a direct influence on the increase in criminality and the extermination of children and adolescents. There is also the high rate of unemployment that plunges the family into a difficult situation of illness and despair. In this situation of so much suffering we are called and we take on the in the Community Project the missionary aspects that impel us towards justice, peace and the struggle for public policies that guarantee dignity for persons and the care as in the Common Home. It is together with the families of the church communities of the Parish of Saint Clara and Saint Francis of Assisi, in the city of Ibirité, where we are, that we experience the social and pastoral aspects, seeing in the hope and very often sensing the signs of Jesus Christ in the life and the history of the simple people, who have little awareness of their value and the importance of their participation in carrying out the project of God “so that all may have life”. We carry out, in that way, our insertion in the World of Work, with attention to the field of Psychology; teaching in the public school, in places where there are family and social conflicts; in the quest for employment , being in solidarity with those who are unemployed. We accompany activities of the Antoinette Fage Social Centre (linked to the charism and spirituality of the Little Sisters of the Assumption).We help also in the Vocations Ministry and in the inter-congregation aspect with the Assumption Family and other congregations, in their formation meetings and retreats, among other aspects. 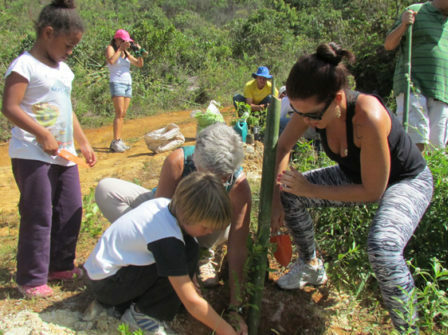 But, among so many activities and options for life that involve us, we are directly involved in the struggle for the preservation of the climate and care for the Common House, in the practice of the mobilization for the defence of Serra Rola Moça. This Serra is a mountain of the mountain complex of Minas Gerais which is localized, but close to our house, our parish. It has fewer minerals due to the struggle of the people united in a small social movement with the aim of facing up to the attacks by the miners at Serra, from which comes the provision of water for the whole city and the irrigation of the gardens, which is the principal work of many families and in some cases, the only source of rent for the house. The miners do not respect the laws for protecting the environment, they mine without criteria and clandestinely. Very often, especially during the dry periods, the Serra is the victim of fires, nearly always criminal, attempts by the big mine owners to appropriate for themselves the natural wealth, proposing the privatization of this natural good of humanity! On these occasions the fauna is decimated and the flora devastated … And, by means of public audiences, there is the lowering/abolition of the actions of awareness-raising and environmental education, like the ecological passeios at Serra and the mananciais that are never counted, with which the group is continuing its evangelizing militancy. This action undergoes much persecution and misunderstanding, as the mine owners have economic power and are capable of distorting the information channels and corrupting the work that had been carried out. With all that we are continuing with faith and hope! During the month of July, in partnership with other social, environmental and pastoral movements we carried out in the city of Ibirité the “Climate Seminar” with the discussion of the defence of the mountains of the Mines. In this seminar we discussed and embarked on important questions in relation to the public policies that are to be implemented for the defence of life in common as for the previous generations, with reflection on the disaster that had occurred, which was known internationally, in the city of Mariana, when the lake with the mineral rejects of the Samarco overflowed over the city and which, in addition to all the destruction that occurred, brought about the death of the River Doce. The actions may appear discreet or small, but they constitute a place of resistance and of struggle that organises us for concrete political actions, with a base in the faith for the conquest of rights, and the sharing of the charism left by the founders of the Congregation of the Little Sisters of the Assumption in the searching and struggles of the poor that gives, with them, a new way of defending life.